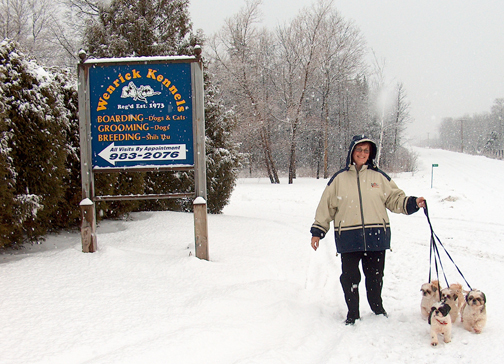 Wenrick Kennels has been boarding dogs and cats and grooming dogs for over 30 years. Our well constructed facilities are located on 10 acres of land in a country setting in Sudbury (Azilda), Ontario. We have an excellent reputation for taking care of your family pet. As retired Professional Dog Show Handlers we had an opportunity to train and condition some of Canadas Top Showdogs and have gained an invaluable amount of knowledge and experience in the care and grooming of a wide variety of breeds of dogs, which we now put to good use in the care of your cherished family pet. All dogs have their own individual spacious runs both indoors and outdoors. The building is well constructed and electrically heated and provides a safe and clean environment to care for your pet in their new Home Away From Home. The individual outdoor runs have a cover over them so your dog is not exposed to the sun or rain depending on the weather and we have large paddock areas your dog is let into individually to get some real running room. Our family business also employs some exceptional staff who all understand and appreciate the amount of TLC your pet requires and how important your pet is to you and your family. Exceptional care of your pet is our # 1 Mission Statement and each and every one of our employees is an animal lover and dedicated to this end. We also have a great deal of experience and this will insure your pet is returned to you after your holiday well socialized and healthy. For our most discerning guests we offer an additional V.I.P. service. Not only will your pet get our high standard of care, they will also get a daily 'one on one' nature walk and playtime. This personal playtime is available to all of our dog and cat clients at an additional fee of only $5.00 per day. Have your pet professional styled and groomed by one of our competent staff. Services include regular grooming appointments or a spruce up after boarding. Nail trimming only is also available. Call (705) 983-2630 or e-mail today to set up your appointment to provide your pet with complete, professional yet personal care.